When it comes to online piracy the Ukraine has built up a bad reputation over the years. The Eastern European country has been branded by the U.S. as one of the top piracy havens in the world and was placed on the USTR’s priority watchlist. To counter this image a group of Ukrainian media outlets has started the “Clear Sky” initiative. The coalition’s goal is to find solutions to online piracy. However, with one of their first campaigns they appear to put the ball back in the court of international companies. The group commissioned the research outfit InMind to take a closer look at the advertising revenues of two of the country’s major file-sharing websites, Ex.ua and FS.ua. 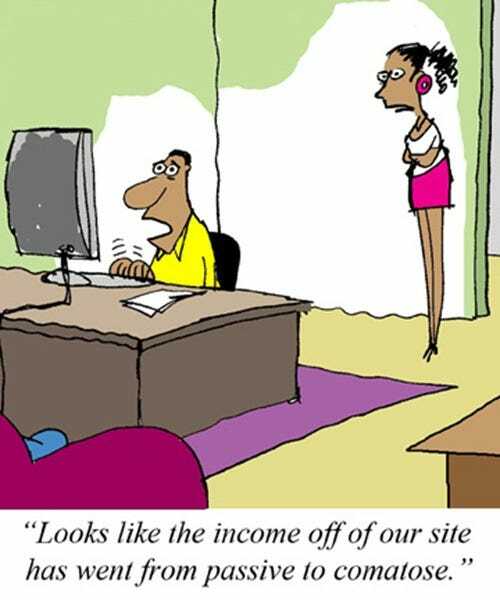 Both sites have millions of visitors per week and generate a healthy revenue stream through their ads, some of which are paid by global companies. According to the report about 10% of all ads on the two file-sharing sites are financed by well-known international brands. Nearly half of all those ads (4.2% of the total) come from Samsung as the bar chart below reveals. A big chunk of Samsung’s advertising budget in the Ukraine goes to the two file-sharing sites according to the report. “The research reveals that 15% of all Samsung`s ads in Ukraine are placed on the pirate websites Ex.ua and Fs.ua,” Clear Sky informed TorrentFreak. Samsung is not the only international brand that advertises on pirate sites, the top 20 also lists other familiar names including Nokia, Canon, Carlsberg and Coca Cola. Other international brands are better at avoiding these sites. 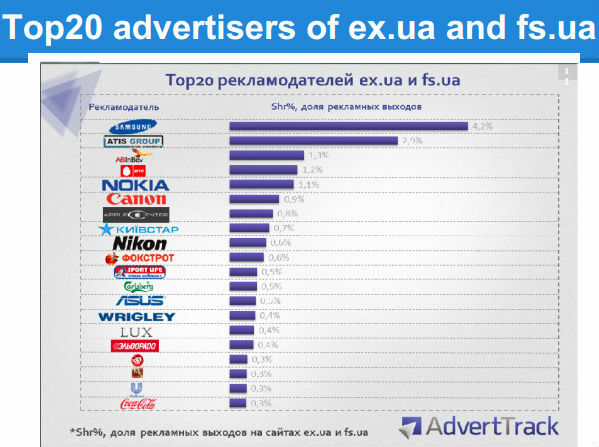 For example, Kraft and Procter and Gamble advertize more on the Ukrainian Internet than any other the other brands listed above, yet they are not listed among the top 20 advertisers on Ex.ua and FS.ua. Clear Sky said that they have demanded an urgent audit of the global online advertising practices of several of the world’s largest brands in order to support its domestic anti-piracy efforts. “Clear Sky believes that malpractice within global online advertising and the ambiguity surrounding the wider digital environment, are key factors currently enabling piracy to flourish while damaging anti-piracy initiatives,” the group added. According to the research 40% of the Ukrainian population is exposed to ads from these global brands on file-sharing sites, which gives the impression that these sites are legitimate entertainment portals. Pavel Mykolyuk, director of the law firm Vindex and a key member of the Clear Sky coalition, calls on international partners to help address this issue. “Clear Sky is calling for international collaboration to ensure anti-piracy efforts are optimized by changing the status quo, a situation that sees brands – sometimes unwittingly – fueling the illicit revenue of these sites and consequently exacerbating the global problem,” Mykolyuk explains. How much these international brands indirectly pay to file-sharing sites remains unclear. 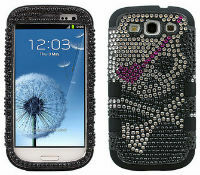 Some experts estimate that Ex.ua and FS.ua alone already generate millions of dollars in revenue.